I have babies on the mind these days. It seems that many of my younger friends and relatives are having babies soon, and what could be more fun to make a card for? As I was looking at all of the stamps in the PaperTrey Ink Bitty Baby Blessings set last month, I had an idea for a bib card. This card is a congratulations card, but these could also easily be used as birth announcements or thank you notes. 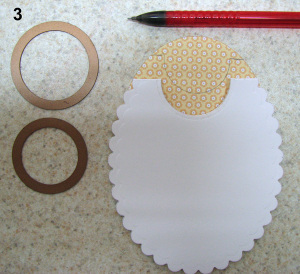 I began by using my largest Spellbinders Petite *Scalloped Oval die to cut a card base. 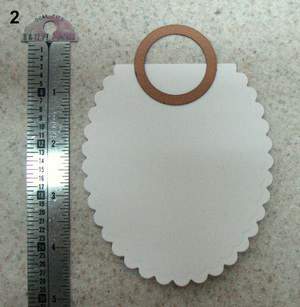 If you are using PaperTrey Stamper's Select white for your base layer, you will probably have to run it through the cutter more than once, and you may have to add an extra cardstock shim as well to get it to cut through two layers of a heavier weight cardstock. My base layer was cut to 4-1/4" x 9", then scored in the center of the 9" side. Pictured above, the fold is at the top of the die. 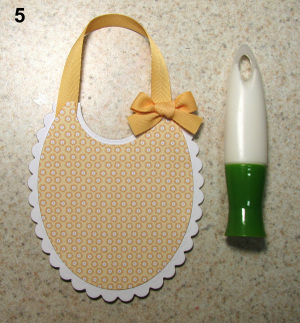 *You can use the Classic Ovals, but your bib will be smaller. The largest Petite Oval is larger than the largest Classic Oval. The petite refers to the size and number of scallops--not the size of the die. HTH! 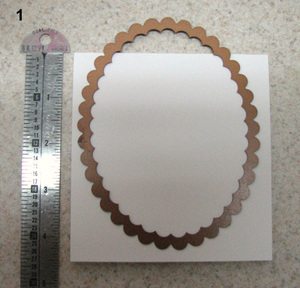 Next I used a circle die to cut the neckline out, placing it as shown above. After cutting the card base and neck, I cut a piece of Bitty Baby Blessings patterned paper with the largest plain petite oval die. I placed the die-cut paper on the back of the card with the print patten up as shown, then penciled in the neckline and shoulders from the base layer. I used a larger circle die to cut out the neckline so that I would have a white piece around the neckline to visually serve as a piece of binding, but I cut the shoulders even with the top of the card base, giving the illusion that the pattern continues over the back of the bib. The base layer and trimmed patterned layer look like the picture above at this point. I cut a strip of Summer Sunshine twill to approximately6" long and used a mini glue dot on each end to attach the twill to the base layer, centering it over the shoulders of the bib. Finally, I stamped the baby carriage image on the patterned bib front, as well as on a coordinating patterned paper layer. I cut the carriage body from the coordinating layer and attached it on top of the stamped carriage using foam tape, and I added a button (Foo-Fa-La Whirligig Bag-O-Buttons by Autumn Leaves), as well as a tag (PaperTrey Ink Favor It Baby). I stamped the tiny baby carriage from Bitty Baby Blessings on the front of the envelope and glued on a coordinating patterned paper there also. 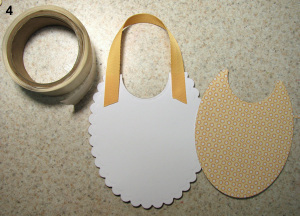 These bib cards will fit into a regular A-2 sized envelope.